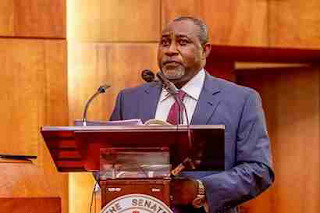 Home News & Politics Minister of state for Labour, Mr James Ocholi, SAN has been reported dead. Minister of state for Labour, Mr James Ocholi, SAN has been reported dead. The senior advocate was involved in a ghastly motor accident on Sunday while travelling to Abuja. The minister’s death was confirmed by his friend and the minister of state for Aviation, Mr Hadi Sirika. Sirika via his Twitter account @hadisirika, said “It is too heavy to bear the loss of my friend, minister of state, Hon James Ocholi, SAN. (@Hauwytee) who witnessed the accident while similarly travelling to Abuja said the minister died on the spot. Ocholi hails from Kogi State and was by general agreement seen as one of the superlative minds in the federal cabinet appointed in November2015 based on his performance during the ministerial screening at the Senate.